Although bright colors are festive, they tend to draw in bugs. Opt for cool neutrals to blend in and keep bugs at bay. Perfume and cologne draw in bugs like nobody’s business. Water settings may seem ideal for a picnic, but they harbor bloodsucking mosquitos and other insects that can pillage summer fun. Marigolds make great centerpieces and have strong insect-repelling properties. Citrus fruits, particularly peels, possess strong bitter oils that can repel pests, providing effective, yet tasty NJ pest control. 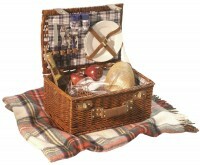 Pack them at the top of your picnic basket and place them around your picnic spread. Send your table for a swim. Placing the legs of your picnic table in trays of water prevents ants from crossing and crawling across your feast. Keep it in the clear. Nothing kills the picnic mood faster than taking a swig of a bug-contaminated beverage. For drinks, be sure to use transparent vessels with lids to keep bugs out – and keep an eye on contents. That’s right. Host a party for the little beasties – a few yards from your picnic site. Deck it out with overripe fruit, sugar water, and melon. Providing bugs their own smelly feast keeps them from invading yours! Don’t let bugs ruin your good time. Contact Allison Pest Control today, your NJ pest control problem-solvers.